After many delays I’m now getting very excited at the publication of my new book on Illumination. I’ve updated a lot of the techniques from my previous British Library book ‘Companion to Calligraphy, Illumination and Heraldry’ (can’t believe how long ago that was published! ), and it links very well with my DVD on Illumination. I think that we’re on the home straight now, and could even get copies in time for Christmas! Fingers crossed. My favourites are those by Birago as he paints saints and angels with the most fabulous cheek bones and really curly hair. They almost look as if they have put their fingers in electric sockets such are the curls, and despite being angels they don’t seem to have known about frizz-eaze! My angel is a copy of one painted by Birago and is of a chorister, but I popped a quill into his left hand to make him into a scribe (or an illuminator) ready to write or lay gesso into a book. 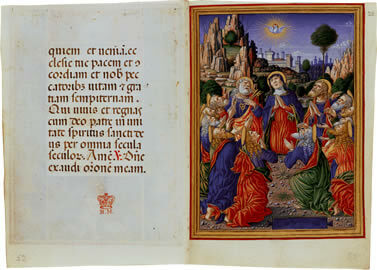 This entry was posted in Blog, Calligraphy and lettering and tagged books, illumination, Sforza Hours on 29 August 2013 by Administrator.